Repairing Concrete Steps | 41 Lumber - Serving Iron Mountain and the U.P. 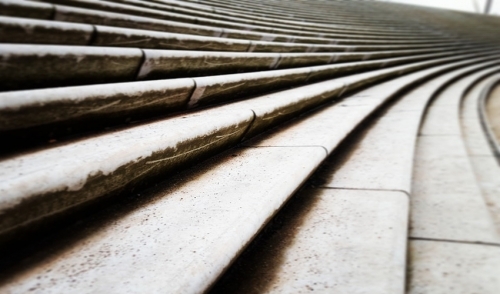 If your home has concrete steps, there may come a time when a little repair is necessary. Depending on the age of your steps or their exposure to the elements, the level of damage can vary. Though it may seem intimidating, the job isn’t too difficult. With just a couple exceptions, it can be completed with a few basic tools and materials. To begin, determine the amount of damage, which will dictate the type of repair that is needed. If all you need to do is fill the cracks in your concrete, then the process is relatively easy. The first thing is to completely clean the area. A stiff brush or compressed air works well for this. If there appears to be any loose or crumbling material, chip it away with a hammer and cold chisel. Once all of this material has been removed, thoroughly rinse the area to prepare for the next step. Apply a liquid concrete bonding agent to the affected area using an old or cheap paint brush. The area should still be wet from the previous step, though not have any puddles. Work the liquid bonding agent into the material. Take care to only apply it to the damaged section, that way you will minimize the chance of staining the surrounding area. For the next step, you can use either a vinyl concrete patching compound or a cement mixture of one-part cement and three-parts sand (add enough water to form a stiff paste) to fill the crack. If the crack is wider than 1/8 of an inch then you should pack foam backing rods into the crevice first. Once the rods are in place (if necessary) apply a thin first layer of the patching compound. Next work the patching compound into the crack with a putty knife or trowel. Make sure to pack it in. Allow it to set up for at least an hour before smoothing over the patch with a trowel, attempting to match the level and texture of the existing material. If foam backing rods are used, place something heavy such as bricks or cinderblocks over the patch for a few days until it has completely cured. Make sure that you separate the bricks or weights from the patch with a layer of plastic. As with above, remove all loose and crumbling material. To properly repair broken or crumbling concrete -- or entire treads, you must first build a form to create the shape of your step. 1 x 4 or 1 x 6 boards usually work well for this. It is important that the forms are held firmly in place and remain flush with the face and sides of your existing concrete steps. Place stakes in the ground and use nails to hold the forms together. Most damage to concrete steps occurs on the outer edge of the tread, where it meets with the riser below. To build a form for this, you simply need to firmly place a board against the riser below (the board can be held firmly with a row of bricks) and attach boards on either side if necessary. Once your forms are all set, prepare your concrete mixture according to the package directions. Dampen the area to be repaired (including the wood forms) by misting with a hose. You may now apply your concrete bonding agent to the area. Next, fill in the cavity with the concrete mixture. Using a trowel, spread it evenly and work it into the cavity. For deeper holes, make slicing motions through the patching material to work out the air bubbles. Level the surface so that it is even with the existing material. Use a wood float to smooth out your patching material. Once your patch has set for about an hour, use the wood float again to smooth out your patch until it equals the texture of your existing concrete. Next, cover your patched steps with a layer of plastic. Be sure to weigh it down with something to keep it in place. You will want to keep it covered for at least a week, to allow it to cure. Make sure to lift the plastic and spray your patched area a few times each day. For all of the right tools, materials and answers you’ll need to get the job done properly, stop in and our knowledgeable staff will be glad to help.